Your Shopping Bag contains 0 items. Sold and fulfilled by FastSpring. In a sense, mimoLive was born on August 11th, 1999. That was the day when we produced our first large scale live video stream on the Internet: The total solar eclipse of 1999. I had become friends with Markus, the CTO of the largest website in Germany at the time, Focus Online, when we both worked for Apple touring Germany, Austria and Switzerland to train Apple Service Partners. Markus actually took a holiday from his duties as CTO of Focus to go on those tours, which had a brutal schedule, and after we finished our duties, Markus worked some more hours fixing his servers. He is that kind of guy. But I digress. My former physics teacher at the Max Born Gymnasium (the German version of high school), was an astronomy buff. For him, the solar eclipse was the perfect occasion to get the students excited about his favourite topic, so he decided to put on a huge solar eclipse party. At the same time, Apple was looking for use cases for the brand new QuickTime Streaming Server. I thought: Why not combine all of this and live stream the solar eclipse from the observatory – the largest school observatory in Germany - of the Max Born Gymnasium? 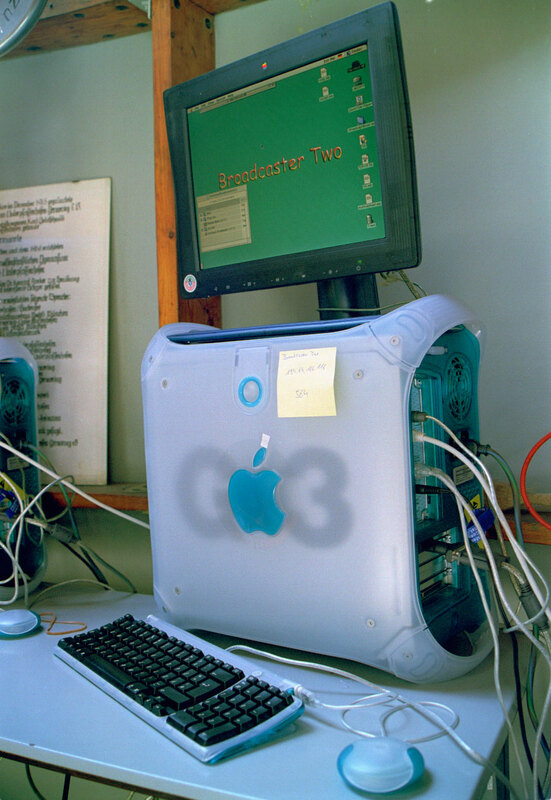 It was easy to convince the MBG, Focus Online and Apple and so, on August 11th, 1999, the observatory was stuffed with PowerMac super computers and a top notch Sony video camera attached to the telescope, ready to stream the event to the world. 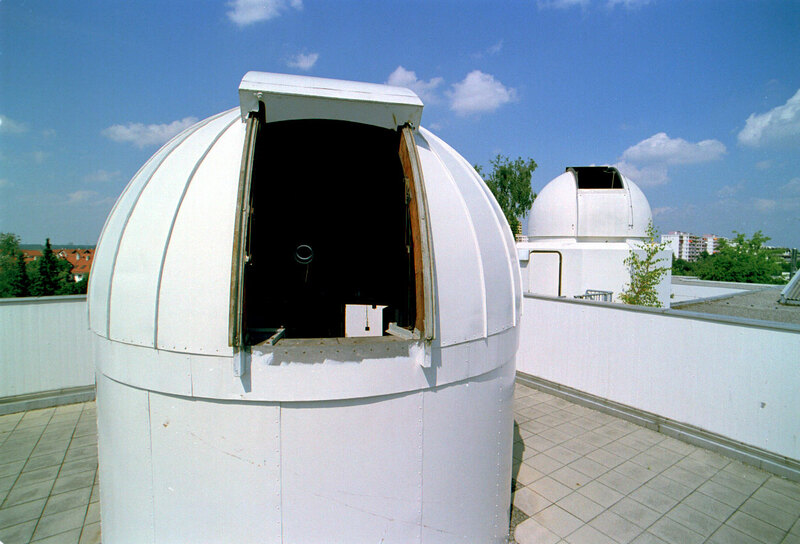 In the end, the telescope proved to be too powerful to be useful, so we just taped the Sony camera to the side of the telescope and pointed it at the sun directly, but the telescope’s tracking proved indispensable for keeping the sun in the center of the camera view. Shortly after the live stream started, Markus’ mobile phone started beeping like crazy: One server after the other texted panic from overload due to too many watchers. Markus looked at me with a huge smile on his face and said: “That’s a job well done!” It was the largest online live event in Germany at that time. None of us could have imagined that the enthusiasm for live video streaming born on that day would eventually lead to the creation of mimoLive – The Multi-In, Multi-Out Live Video Engine. Apple’s QuickTime technology was way ahead of its time back then: We also produced 360° photos – called QuickTime VRs – of the event as shown in the cover picture of this article. View the 360° version over on Facebook. If you happen to be in Washington DC tonight don't miss the event at Kennedy Center for Performing Arts. SHIFT is a Festival of American Orchestras and Boulder Philharmonic will be featured as the first orchestra. "Nature and Music" is this program's theme, inspired by Boulder's natural beauty and an example of how the orchestra responds to its location. The concert features a multimedia commission commemorating the 100th anniversary of the National Park Service. The composer Steve Lias uses FotoMagico to project the images in synchronization with the orchestra compositions. The event starts today, March 28th at 8 p.m. and tickets are available here. Learn more about animation at Screen Future Summit in Melbourne. This unique conference brings together the screen and education industries to create connections and drive debate around the future of the screen. The keynote topic is: Inter-animating Life, Love and the Universe: Or How We All Learned to Multi-mediate, and Why Animation Can Save the World … Later on you can get some great inspiration for your next animations at the session about Digital Storytelling. Stop Motion Animation is a great tool for digital storytelling and used by educators worldwide in classrooms across the curriculum. If you happen to be in Melbourne do not miss this event. Copyright © 2019 Boinx Software Ltd. All rights reserved. Apple, the Apple logo, Mac, iPhone, iPad, and Apple TV are trademarks of Apple Inc., registered in the U.S. and other countries. App Store is a service mark of Apple Inc.